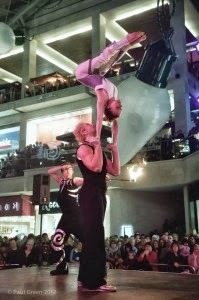 Joli Vyann is a Dance Circus Fusion Company and are looking for a male Dancer/ Acrobat for an R and D project in December 2013 and ongoing work in 2014. We are looking for exceptional, athletic performers. Strong floor work, contact and basing skills are desired, as well as some flying ability. We require a dancer with acrobatic ability or potential, or an acrobat with good movement quality. We are looking for someone who is brave, creative and willing to learn new skills. Between Dec 2013 and Dec 2014 we have various projects, depending on funding. This work is paid. The year could be extremely busy and so we need someone with high fitness levels. Rehearsal will be either in London or Hampshire. If you are unable to make this audition date and think you are suitable, please contact us anyway.